We will learn how to set up Angular 7 to Angular 7 Beta versions on Windows, Linux, and Macintosh systems in a few minutes. It supports the MVC concept. It always supports SPA applications. It supports unit testing very easily. Angular is an open source project which can be freely used, modified, and shared by others. Angular is developed by Google. Angular is a TypeScript based front-end web application platform. Before going through this session, please visit my previous sessions related to Angular 7 application. To verify the versions of Node and NPM, you have to execute the following 2 commands using the Command Prompt window. Make sure you are running the Command Prompt as an administrator. Angular CLI is a command line tool that helps us create Angular applications quickly and easily. Execute the following command and it will install the latest version. Open the browser and type https://cli.angular.io/ to check if you have installed Angular CLI successfully. Open the command prompt and type the following command. This will install TypeScript on your system. Now, type tsc --version in the command prompt to check the version of TypeScript installed. For Angular 7, type the below command to install Angular 7 globally on your machine. 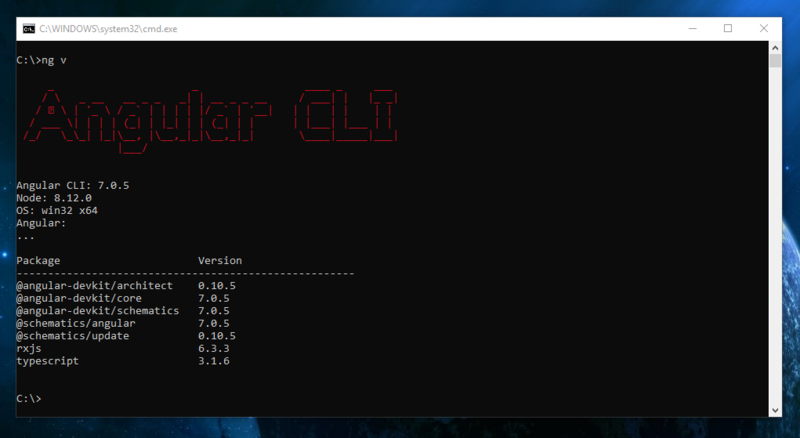 Then, type the below command to check if Angular CLI is correctly installed or not. As you see, we have Angular 7.0.5 installed but not the beta version. Let's see next steps how to achieve it. Install Angular 7 Beta globally on the machine. Open the terminal and type the below command. It allows installing Angular 7 Beta version globally (-g stands for globally) on our machine. For Linux or Mac, we should add sudo to grant the installation permission. Now, the Angular 7 Beta version (7.3.0-beta.0) is installed on our machine, as shown in below image. 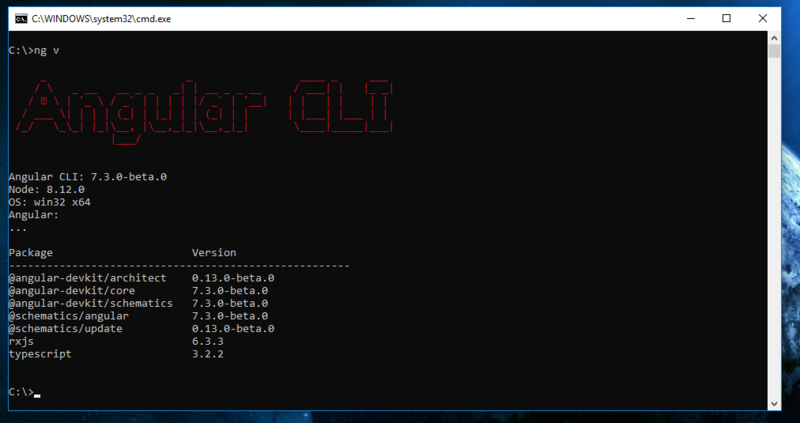 Then, type the below command to check if Angular CLI Beta version is correctly installed or not. Angular Compatibility Compiler (ngcc) is used to convert the node_modules. It includes bug fixes as in Bazel; compile_strategy() is now used to build Angular code using ngc or ngtsc. compile_strategy() is included in Angular 7 beta version. Angular 7 beta version is enabled with better error handling for @output in cases. The reference() (r()) instead of closures takes a nesting level, and the local index of ref then walks the view tree to find the accurate view and it stores the local ref.w. from that path. TView.components are used to host element indices. It enables g3 BUILD rules. It allows ivy testing in g3. The parent contexts instead of template functions are used to get rid of the need to create multiple function instances for loops that are nested inside other loops. Template functions are not implemented in Ivy.